If at the time of laying eggs the female canary stays bristled up and immovable, this could mean that it has difficulties in laying eggs. The mature egg, ready to be laid, cannot pass through the cloaca – the reasons can be different. The normally formed egg cannot be laid by the female only when it is ill or weak. In extraordinary situations very often it happens so that the egg has no shell and only an egg with a shell can press the muscles of the oviduct – a soft egg without a shell can do this. The shell does not form only when the organism of the female bird does not have enough calcium. Excessively young females very often have difficulties in laying eggs. IMPORTANT! If you do not have enough experience, take the bird to a vet. Only a very experienced selectionist can afford to try different types of help. - Turn on the infrared light. - With a pipette drip a drop into the cloaca. It very often helps and after half an hour the egg gets out. - Very easy and carefully massage the area around the cloaca.The egg without shell cracks and practically drips out. Controversially - the normally formed egg should not crack as pieces of the shell can cause internal traumas. 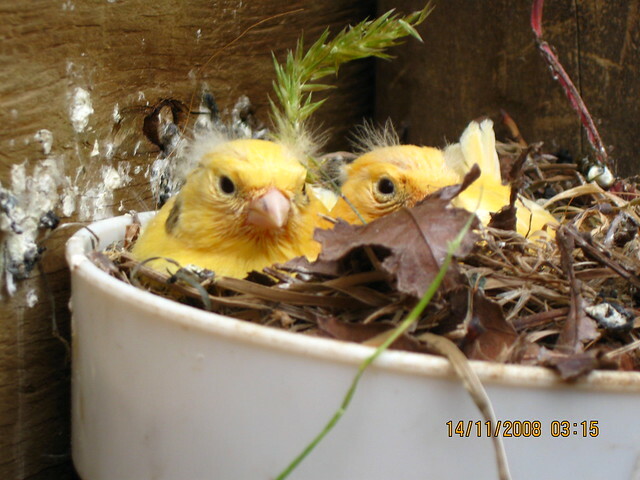 Generally, female canaries are ready to nest from spring till the beginning of summer which makes it possible to nest once -twice a year, the same as the free-living canaries. The delicate domestic canaries could “ fall out ” of this rhythm and to be ready to nest for excessively long time. More than 2 nestings a year are very exhausting for the female bird. In such cases, you should interfere and prevent them. This, of course, can be done after the first nesting in case that you don't want other small ones. One of the possibilities is not to give the female bird any opportunity to make a nest, this means to take out all materials necessary to make a nest. Sometimes this reduces its desire to build a nest. However, many female birds go on by plucking feathers from themselves or from the male canary. In such cases, you have no other chance than allowing the bird to build the nest and to lay eggs. Then replace every egg laid with an artificial one. The female bird can incubate these eggs as long as it wishes. Finally, remove the nest – you should not trouble that the female bird will suffer from psychiatrical shock and will be sad. Such cases in wild nature can be seen very often. Laying eggs is not a guaranty to bring up a progeny, they could not be inseminated. What you should not do? To give medication which prevents nesting.First of all, they are not very efficient and second they are harmful very often.